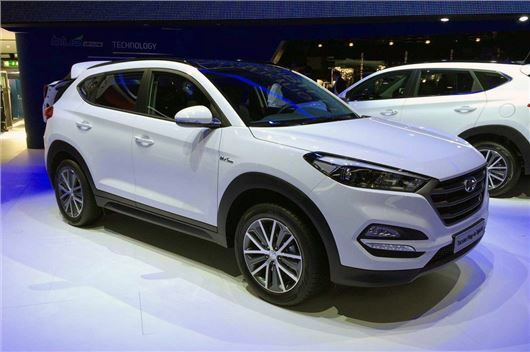 Hyundai has confirmed it is to replace the ix35 with an all-new version of the Tucson. The medium-sized SUV has made its debut at the Geneva Motor Show and will go on sale in the second half of 2015. The Tucson was axed in 2009 - ironically, in favour of the ix35 - but Hyundai has decided to revive the name in a bid to close the gap on the Nissan Qashqai. As a result, the Tucson gets a new platform, a fresh exterior and more cabin space. The exterior is notably different, with a sharper front end that is dominated by a large hexagonal front grille and angular bonnet. The bumpers have also been enlarged, while LED running lights and LED headlights will be available as paid for options. The rear has also been smarted up, with a new tailgate, light clusters and rear spoiler, although we've noted that the rear window looks decidedly small. Hyundai claims to have made significant improvements to the interior, compared to the ix35, with more head and leg room for up to five adult passengers. However, boot space is down slightly to 513 litres, with the seats up. The Tucson does get a new dashboard and steering wheel though, with soft-touch materials and improved levels of comfort. The navigation system has also been revised, with a seven-inch touchscreen and improved software, which should make it three times faster than the previous version. A seven-year free subscription to TomTom Live services will also be included. Power comes from two petrol engines, with the entry unit being a naturally aspirated 1.6-litre with 135PS. A turbocharged 176PS version will also be available, with the choice of a six-speed manual or seven-speed dual-clutch automatic ‘box. There'll also be three diesels, with a 1.7-litre with 115PS mated to a six-speed manual. Those wanting more power will be offered a 2.0-litre unit, with either 136PS or 184PS. Both will get a six-speed manual as standard, but get a six-speed auto as a paid for option. The Tucson will get the choice of two-wheel or four-wheel drive, with the higher petrol and diesel engines most likely getting all-wheel drive.